Okay, confession time. I have an addiction to Chips Ahoy cookies. Like Ozzy Osbourne, I have a thing where I eat the same food over and over again (anyone see that episode about him and Chipotle?). The rule doesn't apply to real meals (I hardly ever make the same recipe twice), just snacks. Hey, I never said I was normal. I was excited to see that my addiction to Chips Ahoy will end up providing me with a free gift from Every Day with Rachael Ray. 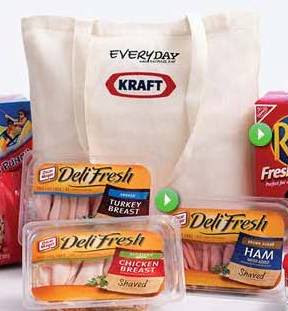 The magazine has teamed up with Kraft to offer a free canvas tote bag if you buy certain products. Then you mail in a little card with some info on it and your receipt and you are golden! The deal runs through the month of May, so there's still time!